Isn't the color breath-taking! This is a crossed cherry tomato in my daughter's garden-when we saw the color-all swirls of yellow and orange-we knew we had a picture that had to be taken. The wool I handspun is a hand-dyed superwash from an EBay store, Jenya Loves Fibers, and it spun like a dream. 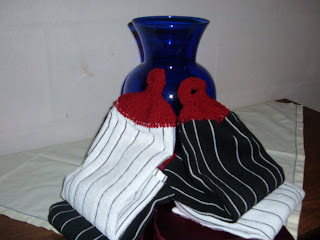 The sock is a free pattern posted on Turtlegirl's blog called the Red Dwarf Socks. 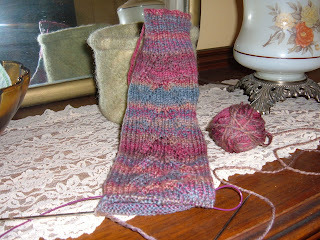 This was my first time knitting toe-up socks and it was a new challenge. Think about all the lace patterns you have tried cuff to toe and now imagine the pattern going the other way.........what creative possiblilities! Aren't these beautiful?! I think they turned out better than I hoped especially since the colors I was aiming for, purple/green and brown, sure are hidden in this outcome--sometimes creative goofs are still jewels in their own right. These will be ornaments for my daughter's feet-I love you, thanks for encouraging my creations and letting me make some for you! I knit some kitchen hand towels for the boy's apt--some traditions need to be passed on to the next generation....thank you, sons, for appreciating this fact. Today our youngest child moved out to share an apt with his big brother. Their jobs are in the same town so it is a nice move for both of them. 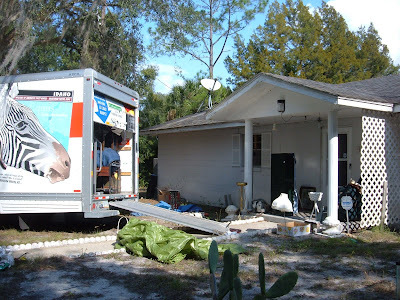 They have both moved out before but I think this move is the final one - have you experienced this, too? This time the move-outs were happy and mature events; we have prepared them for this since birth, right!? 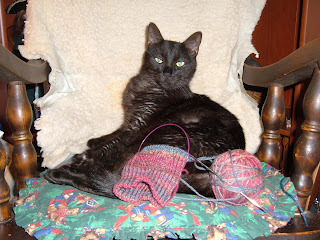 I knitted on the way there and back-the way I verify all occasions in my life-so many events are marked by a particular project that are like memorials to me-even if it just looks like a sock, scarf, sweater, etc. to others....here is today's project-the sock I am making for Favorite Socks KAL. Ahhhh, home....I am always excited to head out on a trip and always so grateful to arrive home again. Held Tommy, my cat, for half of the 8 hour trip and the rest I finally got to do some knitting. This is going to be the first pair of socks from the Favorite Socks book by Interweave Press which was the catalyst for starting the blog-I also joined their KAL (a knit along online group). 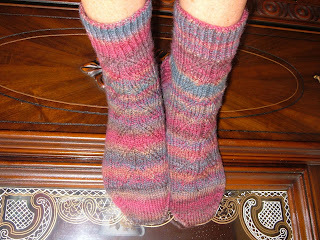 For this pair of socks I dyed the wool, a superwash from Halcyon Yarn, and spun it on my Ashford Joy spinning wheel. It is now going to be a full sock version of the Padded Footlets from the book-the best thing about working with your hands is the individual touch you can add to a design! 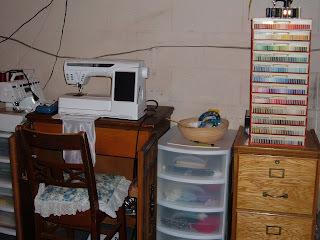 Today I have done something to celebrate a new era of my life, I am joining the community of knitting/spinning bloggers! This year has held a host of new activities-mainly retiring and moving from the Northeast to the Southeast which has been a dream since I was 12 years old. Gratefully, the man I married was blessed with the same inclination and we have aimed for this goal for 31 years!